When practicing archery, it is always nice to have your arrows within easy reach so that they are always ready to go. Quivers make that possible. Any of the quivers offered here at Medieval Archery provide the archer with a good place to store their arrows when not in use, while ensuring that just by reaching over their shoulder or to their side they have a projectile at the ready, to be nocked and fired at a moment's notice. 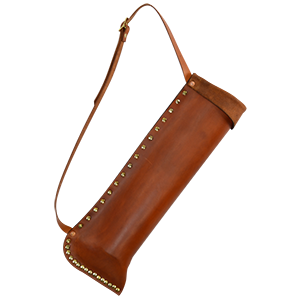 Many of our offered quivers are made entirely from high quality leather. They come in a variety of styles, and are divided up by how they are worn - on the back or on the hip. And while there are subtle differences between the two placements, ultimately it is personal preference that plays the biggest factor in how you want to wear your quiver. We offer plain quivers for the archer wants no muss and fuss from their accessories, as well as highly stylized and fantasy designed quivers that are perfect for the more stylized archer and enthusiast to carry and use. We also offer youth quivers, to suit the stature and size of the young archer too! It is no fun carrying all of your arrows in your off-hand, and sticking them in the ground takes time an archer does not always have. Save yourself the hassle and pay us a visit at Medieval Archery, so that we can hook you up with a good quiver that will hold all your arrows and keep them well within easy reach. When it comes to selecting your quiver, personal preference plays a large part. Not only will it affect the design and style of your quiver, but also its placement. Here at Medieval Archery, we try to make selecting your quiver easy. If you prefer to carry and draw your arrows over your shoulder from a back quiver, than this section is the one for you. Since a back quiver keeps the arrows slung over your shoulder, it is a perfect choice for the archer on the go, allowing them to move without catching their arrows on their surroundings. As a benefit, a back quiver also keeps the arrows within easy reach, should a shot present itself. 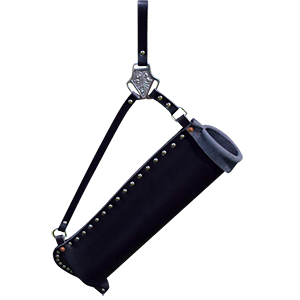 Our back quivers are all made using high quality materials and leather, and they come in a variety of different styles. For a tried and true archer, a more basic and traditional back quiver or hunters quiver will work wonders. 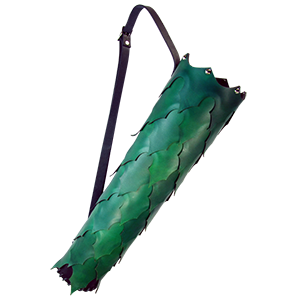 For the archer with an interest in fantasy, a LotR quiver or a dragon scale quiver might be more appropriate, offering up a stylized look with the same great functionality. Whichever style of arrow quiver you chose to carry, though, you can bet that any of the back quivers found here at Medieval Archery will work wonders for you when it comes to securing your arrows in an easy-to-reach position. When it comes to selecting your quiver, personal preference plays a large part. Not only will it affect the design and style of your quiver, but also its placement. Here at Medieval Archery, we try to make selecting your quiver easy. If you prefer to carry and draw your arrows from your side via a hip quiver, than this section is the one for you. Worn at the hip, a belt quiver allows the archer to draw arrows from the waist, simulating to a degree the age-old practice of medieval archers keeping their arrows stuck in the ground before them. This immediate placement makes it great for quick, continuous shots, fired one after the other without much need for movement. Our belt mounted quivers also come in a variety of different looks and styles, ranging from more traditional hunter quivers for the no-nonsense archer to more stylized designs like elf quivers and fantasy quivers for the archer who wants something a bit more distinctive and unique. They are also all made from high quality materials, including fine leather and more. If you are planning on practicing archery, than you can bet that having one of Medieval Archery's hip quivers mounted at your side is one of the best ways to keep your arrows within easy reach.